1. Remote Key Shell with blank key. Alloy wheel lock kit for all 1998+ vehicles. Genuine new Toyota Part. Genuine Toyota Gray color Carpeted Floor Mat set. Set of 3. Left & Right front along with center row seats. Genuine Toyota Oak color Carpeted Floor Mat set. Set of 3. Left & Right front along with center row seats. Center Gear Shift Console Cubby 1998-2007 100 series. This can be used when removing automatic height control to replace AHC switch. Chrome Door Pillar Kit 100 series. Door Control Transmitter Module 1998-2002. This is the buttons and transmitter module within the key shell. Genuine Toyota with an over $300 retail value. Brand new Brush Guard for 100 series. 3 Year Rust Warranty. Uses Factory mounting and bumper. Hand throttle cable for 1998-2002. Part of complete hand throttle kits #53302-60041-B2 (stone trim) and #55302-60041-A1 (ivory trim) elsewhere on this site. New genuine Toyota part. Complete hand throttle kit for 1998-2002 with gray (a.k.a. "Stone") trim. Includes throttle cable (#78410-60120) and knob (#78411-22010). New genuine Toyota parts. Complete hand throttle kit for 1998-2002 with ivory trim. 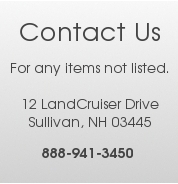 Includes throttle cable (#78410-60120) and knob (#78411-22010). New genuine Toyota parts. Hand throttle knob for 1998-2002. Part of complete hand throttle kits #53302-60041-B2 (stone trim) and #55302-60041-A1 (ivory trim) elsewhere on this site. New genuine Toyota part. Hand throttle kit panel for 1998-2002 with gray (a.k.a. "Stone") trim. This is the panel only! Complete kit (#53302-60041-B2-K) is available elsewhere on this site. New genuine Toyota part. Hand throttle kit panel for 1998-2002 with ivory trim. This is the panel only! Complete kit (#55302-60041-A1-K) is available elsewhere on this site. New genuine Toyota part. Hood protector/bug deflector for 1998-2007 Land Cruiser models. REINFORCEMENT, BACK DOOR OPENING SIDE, RH 98-07 100 series. Style with quarter mount spare tire carrier. 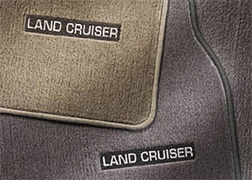 3-piece ivory carpeted floor mat set marked "Land Cruiser" for 100-series 2003-2007. New, genuine Toyota part. Rear insert kit for center bumper mounted hitch. Fits 1998-2007 LX470 This allows fitment of the 2" type receivers. If your remote master key shell is broken or cracked. Just reuse your existing buttons in a new housing! !/ These are higher quality then most aftermarket key shells that are available. Spare Tire carrier wheel lock. Easy do-it-yourself trailer wiring harness. No cutting or splicing! Fits 1998 - 1999 Landcruisers and Lexus LX470. 1998-2007 Land Cruiser. Please pick year required! Wood Grain Trim Kit 1998-2002 / No Navigation type. Aftermarket stick on trim kit. Wood Grain Trim Kit 1998-2002 / With Navigation type. Aftermarket stick on trim kit.